Piers Sellers in conversation with Rona Munro and John Zarnecki. Little Eagles, written by playwright Rona Munro, tells the extraordinary story of Sergei Korolyov, chief designer and unsung hero of the Soviet space programme. 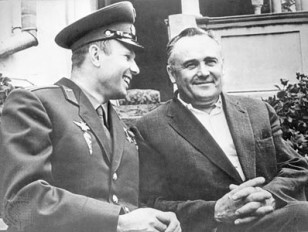 Under the leadership of this remarkable man, the USSR trounced the Americans in the space race throughout the fifties and for much of the sixties, achieving a series of firsts including the first human in space and Earth orbit. The 50th anniversary of this first flight by cosmonaut Yuri Gagarin, one of Korolyov’s beloved ‘little eagles’, is celebrated this year. Playwright Rona Munro, Professor of Space Science John Zarnecki and NASA astronaut Dr Piers Sellers will discuss the legacy of the space race and compare the challenges faced by Korolyov with those for space exploration today. They will reflect on this inspirational period of space travel and its impact on science, the arts, and our own human aspirations.